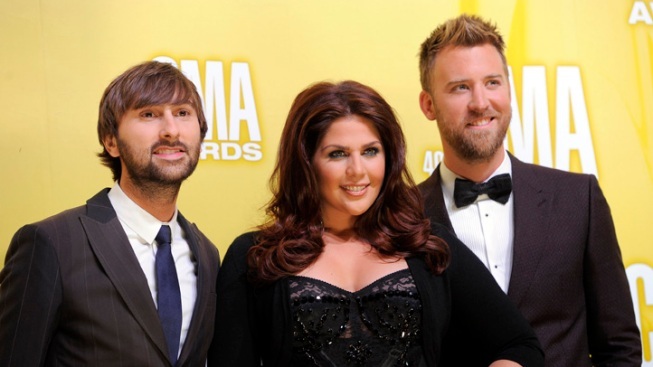 Members of the band Lady Antebellum, from left, Dave Haywood, Hillary Scott and Charles Kelley, won the breakthrough award at the 2012 Billboard Touring Awards. When they first hit the road as an opening act the members of Lady Antebellum rarely wasted their downtime, quizzing stars like Kenny Chesney and Keith Urban and their crews on the intricacies of a successful arena tour. They employed everything they learned on their first headlining tour this year, selling more than a million tickets and visiting 11 countries. That success on the Own The Night tour earned them the breakthrough award at the 2012 Billboard Touring Awards on Thursday night in New York City. "I think for us, once you've found out ... who had won it the previous two years with Lady Gaga and Jason Aldean, I think it definitely made it even mean a little bit more," Lady A's Charles Kelley said in a phone interview. "Hopefully, we're going to be in that company of big touring acts." The Nashville trio wasn't able to make it to New York for the awards because a storm left travel too dangerous. Chesney made the trip, though, and accepted two awards at the Roosevelt Hotel: the Road Warrior award and the top package tour. The Road Warrior honor is bestowed on an artist who shows uncommon work ethic, professionalism and artistic integrity on the road. Chesney won his eighth package award for his Brothers of the Sun stadium tour with Tim McGraw, Grace Potter & The Nocturnals and Jake Owen. Kelley said Lady Antebellum, which will release a documentary about the tour on Dec. 4, paid close attention while on the road with Chesney. He's parlayed hit songs and high energy into his status as country's top draw for a decade. The singer showed the bandmates the level of commitment required to pull it off. "I think that's one thing that we've learned was you've got to invest in the show," Kelley said. "When you're sitting there and you're putting it together and you're seeing those costs pile up, and you're going, 'OK, I'd love to have a lift here to bring up the piano,' well, that's going to cost you this much," Kelley said. "You've got to make those decisions. For us, we wanted to come out swinging on this first tour. Hopefully, we've set the bar for future tours."